Sad news. The 15-year-old pedestrian who was struck during a vehicle crash involving Los Angeles Laker Lamar Odom's chauffeur has died of his injuries, according to TMZ. The limousine struck a motorcycle and pushed it into the teen on a Queens, N.Y., street last Thursday. Odom, who was in the back seat, was not injured. He was in town to attend his cousin's funeral. 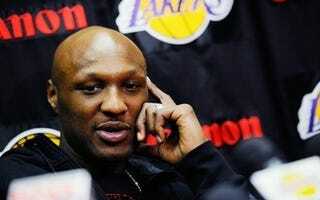 Odom is "devastated" by the tragedy, the site reports. The teen sustained massive head injuries in the accident. Odom's wife, Kloe Kardashian, was not in the car at the time. In other news: Candorville: Uncovered.